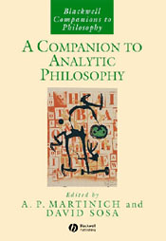 A Companion to Analytic Philosophy is a comprehensive guide to many significant analytic philosophers and concepts of the last hundred years. Provides a comprehensive guide to many of the most significant analytic philosophers of the last one hundred years. Offers clear and extensive analysis of profound concepts such as truth, goodness, knowledge, and beauty. Written by some of the most distinguished philosophers alive, some of whom have entries in the book devoted to them.